While we send a lot of tools out to the jobsite for testing, these stayed in the lab. We drilled holes to compare the new 2804-20 M18 FUEL hammer drill to the 2015 model 2704-20. After loading both with 3/4-inch spade bits, we went to town testing both power and speed. We also tested using 2-inch hole saws. After drilling hundreds of holes in 2X lumber, I was able to gauge performance and speed on a pretty consistent basis. It measures near-identical to the former model. It comes so close, in fact, that there wasn’t any appreciable data to indicate one tool over the other. Of course, the reduced girth and length of the 2804-20 made it a tad easier to manage. The new hammer drill weighs 4 pounds 12.8 ounces with a 5.0Ah battery installed. Compare that to the 5 pounds 1 ounce of the 2704-20 and you see a savings of 4.2 ounces (like a quarter pounder with extra cheese). Every little bit helps, and the reduced length puts you closer to the work. We measured the same amount of heat off the new drill as the prior model. At the exhaust port, you can get as high as 129º or more (see left photo). The tool never gets too hot to hold, however. Most of that heat is measured through the port as heat being ejected from the brushless motor. Near as we can tell, airflow is accomplished from the base of the tool through the handle and out the top just behind the brushless motor. This is born out by the thermal imaging we recorded. It’s not the most efficient way of drawing in cool air, and the hammer drill runs hotter than some models we measured in-house…and less than others. It’s certainly not uncomfortable to use. Since heat build-up occurs only after heavy use, and we have yet to experience failure, there’s not much else to say at this point other than we’ll keep an eye on this. The new Milwaukee FUEL drill also didn’t have any trouble punching through pressure treated 2x material with a 2-1/2″ wood-boring bit. Milwaukee also moved the LED light to the bottom of the drill. It seemed to do well in lighting up the work area and only casts a shadow directly above the bit once you make contact with the workpiece. Of the two new tools tested, the Milwaukee 2853-20 impact driver gets the award for most improved. Not only do you shave 5/8″ off the length, but you also get additional speed. While speed isn’t everything, combine it with ample torque, and you get massive performance gains. Testing with 4-inch long x 1/4-inch lag bolts, we saw average driving gains of nearly 30%. The additional 600 RPM really works for you when driving large construction screws and anything else that can take the speed. Unlike the new M18 FUEL hammer drill, the updated impact driver, doesn’t drop much weight. It hit the scale at just 1.5 ounces less than its predecessor. Keeping in mind that the 5.0Ah battery weighs in at 1 pound 9.6 ounces—the bare tool comes in at a lithe 2 pounds 3.6 ounces. Heat didn’t seem a surprise on this model. In fact, it runs a tad cooler—likely due to the increased speed reducing the work time on each fastener. That speed comes into play when you drive larger fasteners. On a Philips bit, you’ll do better on Mode 2 (2,800 RPM) unless you have the dexterity required to keep that bit locked in place at full speed. What we have here amounts to an upgrade that addresses some ergonomic issues alongside a needed speed bump for the impact driver. Milwaukee placed second in our best 18V impact driver shootout, jamming all that performance (and more) into a smaller package. The new tools pack quite a punch, and I can’t say the hammer drill feels much different from its former self. The impact driver, however, really feels more compact. 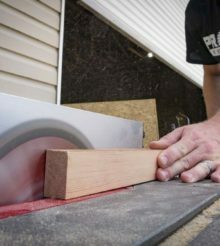 If you take a look at other tools used by Pros, Milwaukee is seriously challenging what kind of size reductions you can make to still have a top-performing product. While we may never see impact wrenches get this small, the performance of both the FUEL drill and the impact driver prove that size doesn’t (necessarily) matter. You can pick up this kit online for $399 with two 5.0 Ah batteries or $299 with one 5.0 Ah pack and a 2.0 Ah compact pack in a Packout box. That Packout kit is a pretty sweet deal. Next Up: One-Key Models Have Been Announced!